If you find yourself in need of crawl space repair, call us today! Crawl space repair should never be left for later because it can not only affect the health and safety of your home and its structural integrity, but it can also affect the health and safety of you and your family over time. Crawl spaces, while they may go unnoticed in daily life, serve a big purpose in our home. They’re used as an easy and convenient access to plumbing and electricity systems. 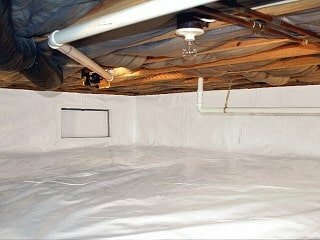 Also, a clean and dry crawl space can be used as a storage area. Symptoms of moisture problems are most often noticed in the humid spring and summer seasons but can occur at any time of the year. Often, a heating and air conditioning contractor is the first person a homeowner calls to deal with the problem. Typically though, the problem is not due to a failure of the air conditioning system; it is caused by poor moisture control in the crawl space and can be solved by waterproofing contractors. 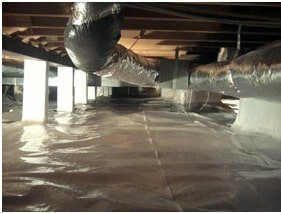 For many decades, building codes and conventional wisdom have prescribed ventilation with outside air as the primary method of moisture control in crawl spaces. In the humid spring and summer, however, ventilation with outside air only makes moisture problems worse. Recent research indicates that a new type of crawl space system, with NO vents to the outside, a water drainage system, and a heavy ground vapor barrier can provide greatly improved moisture control and significant energy savings when properly installed. If you need crawl space repair, call us now. Contact us to learn more about keeping your crawl space dry and usable.